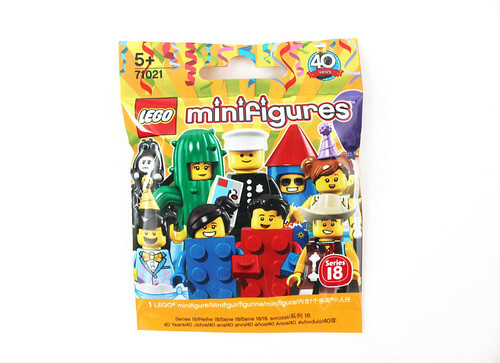 It’s been almost a year since we’ve seen a traditional LEGO Collectible Minifigures series with Series 17 was released in May of last year. 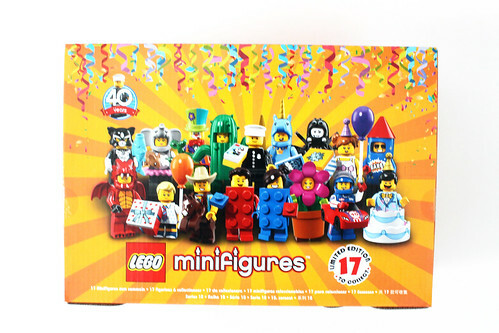 Series 18 (71021) was officially revealed just a few weeks ago and this wave is to celebrate the 40th anniversary of the LEGO minifigure. 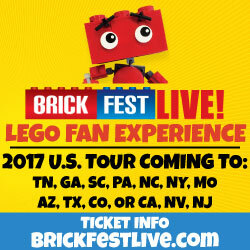 LEGO was nice enough to send us a complete box so we can get an early look at this series but they will be available starting on April 1. 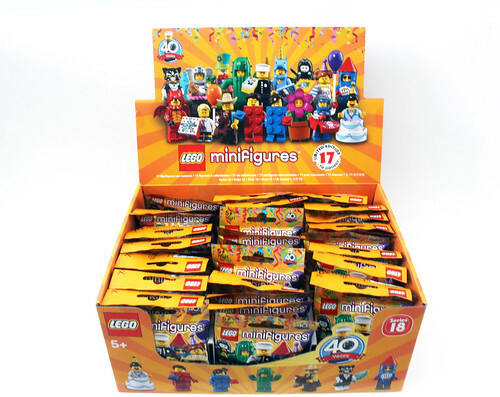 As with some of the previous Collectible Minifigures series like The LEGO Batman Movie and The LEGO Ninjago Movie, the number of minifigures to collect has gone up and this wave will be similar, in a way. There are 17 total to collect with one very rare one which I’ll call a chase figure. 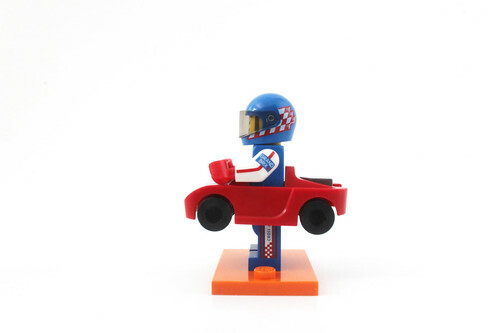 So if you want, technically you can collect the other 16 for the normal set leave out the chase figure. It has been reported that it will only come one per box but we’ll see when I open them all up. 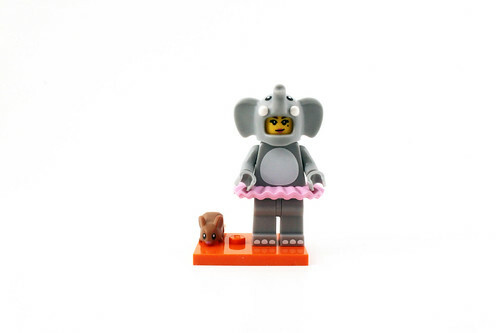 One of the mascot type minifigures in Series 18 is the Elephant Girl. She’s basically a gray minifigure with some white on the torso and feet but that’s about it however she does have a pink ballerina skirt piece that goes between them. Her facial expressions are a smiling one and a terrifed one because of the brown mouse accessory. The head piece is a large elephant head piece complete with large ears and a trunk. 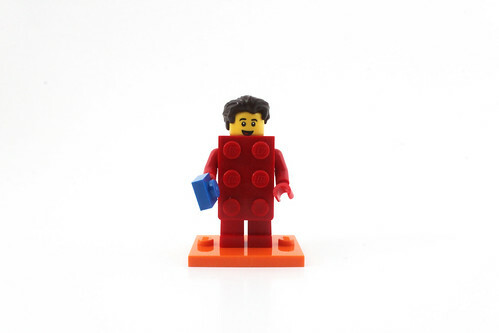 The LEGO Brick Suit Guy represents a red 2×3 brick and is one of the two brick suit characters in Series 18. 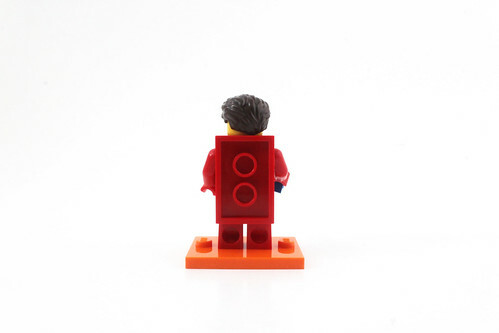 The torso and arms are plain red but the main thing here is the new 2×3 brick suit mold that goes on the legs. 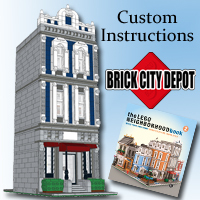 If you’re wondering, yes, you can connect LEGO bricks to the back of the mold. The head is just a simple smiling expression with a nice brown hair piece. 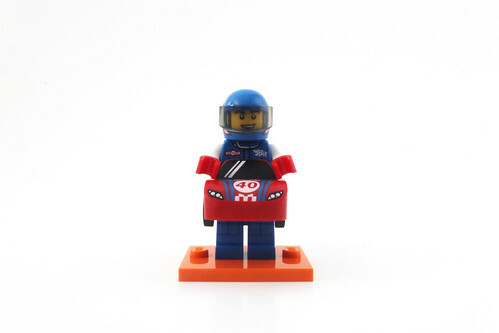 His accessory is an interesting choice with a 1×1 blue plate. 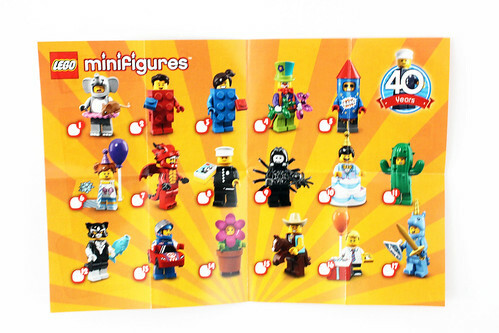 As I just mentioned above, there are two brick suit characters in this wave and the other one is the LEGO Brick Suit Girl. 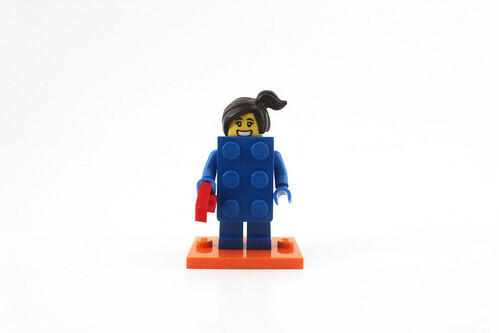 She is basically the same as the LEGO Brick Suit Guy but as a blue 2×3 brick. She also has a large smiling expression with a brown side ponytail hairpiece. 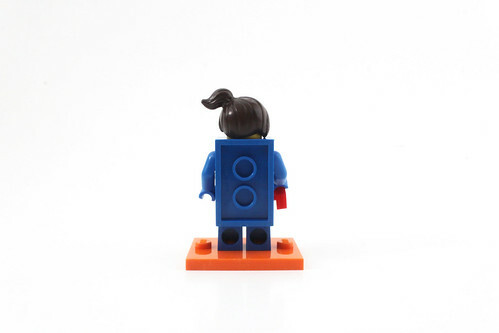 Her accessory complements the other minifigure with a 1×1 red plate. 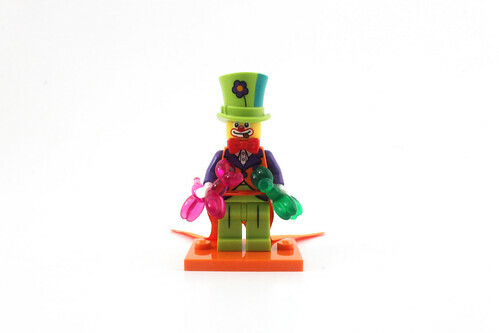 The Party Clown is dressed in a very colorful costume that many have said could be a great beginning to a Mad Hatter minifigure. He has a purple and orange torso with some lime green legs. There’s a long orange fabric coattail that goes between the torso and legs. His facial printing shows him with clown makeup and a tongue sticking out the mouth. The hat piece is a good choice with flower printing on the front. 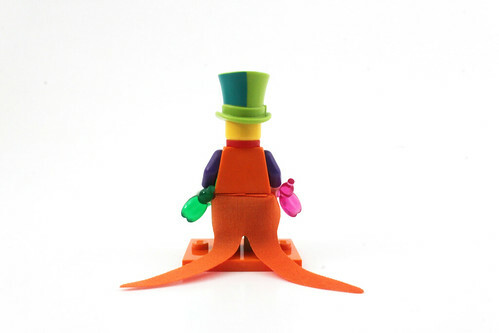 His accessories include two balloon animals in trans-pink and trans-green which I really like. 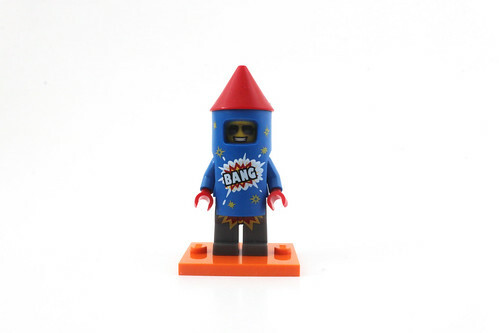 The Firework Guy is one of those mascot type minifigures where there’s a large rocket piece that goes over the head and torso. There’s some star printing all over the mold with the word Bang on the front. The torso is just plain blue with some red hands. The legs are gray with with some printing of an explosion from the bottom of the firework. The head shows him wearing sunglasses with a big smile. 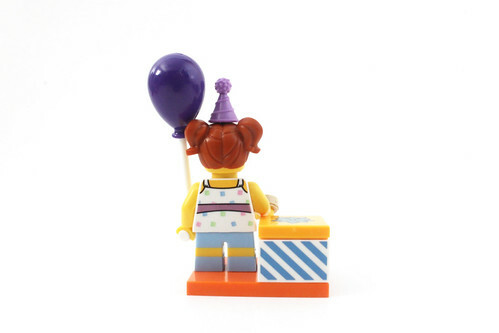 The Birthday Party Girl is a young child celebrating her big event. The torso has printing of a white blouse with a lavender colored bow that goes around the torso. The legs are the short variety with her wearing blue shorts and white shoes. 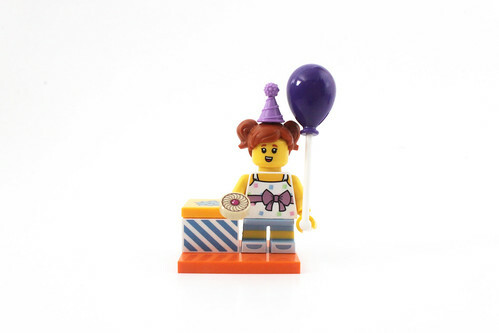 Her hair mold includes a pigtail along with a purple party hat. 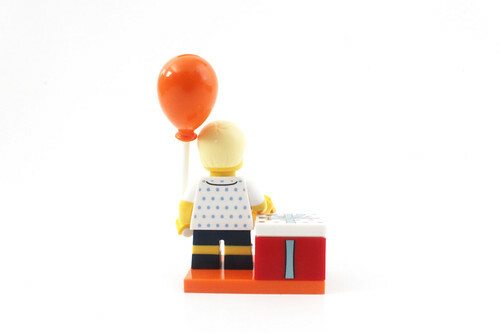 The accessories included is a purple balloon and a decorated present which are filled with some 1×1 round tile cookies. 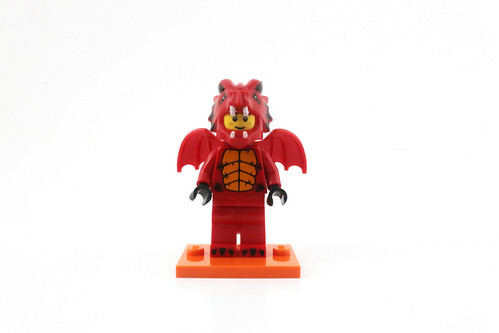 A consensus around the LEGO community is that one of the best looking minifigures for Series 18 is the Dragon Suit Guy. 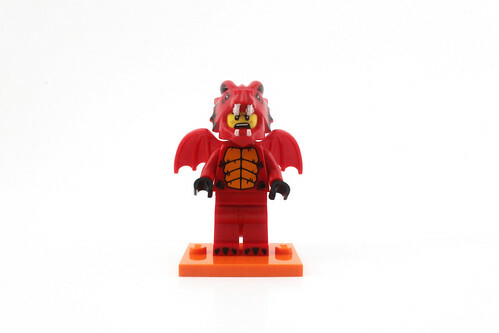 He’s dressed up as a red dragon with black scales throughout the torso. The legs are mostly red with some black for the feet. I believe the tail piece between the torso and legs is a new one and a slight variant from the one that the Series 5 Lizard Man had. There’s also a large wing piece that goes between the head and torso.The head mold is very large with two black horns on the top. The torso for the Spider Suit Boy is mostly black with some white webbing printed on the jacket. There’s a new spider bracket that goes around the neck that is made from a rubbery plastic. I do like the use of this new piece instead of the traditional way of using the octangular piece for the arms. His face is plain white with a stoic expression on one side and a scared expression on the other with a spider head mold going over it. 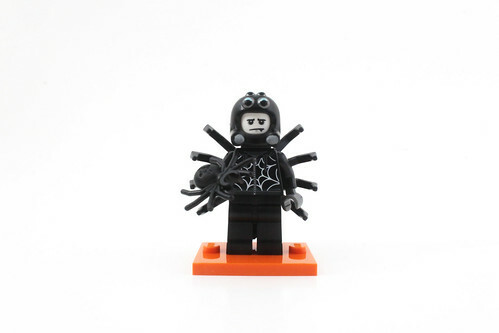 His accessory is a black spider. 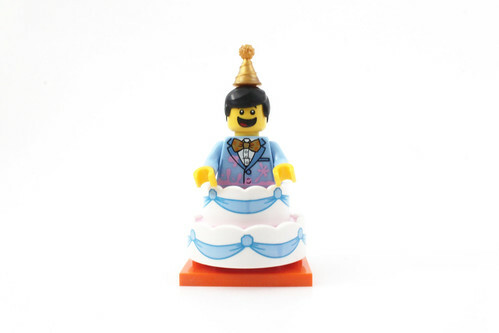 The Birthday Cake Guy is dressed up in a blue tuxedo with a yellow/gold bow tie. There’s also some pink icing splatter on the torso as well. The legs are pink with some blue icing on it. 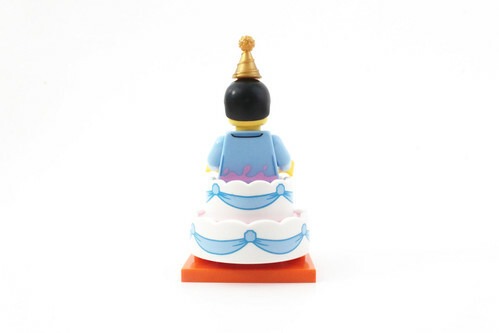 He stands inside a large two-tier cake that is decorated all around. He has a very large smile on his face and wears pearl-gold party hat that plugs on top of the hair. 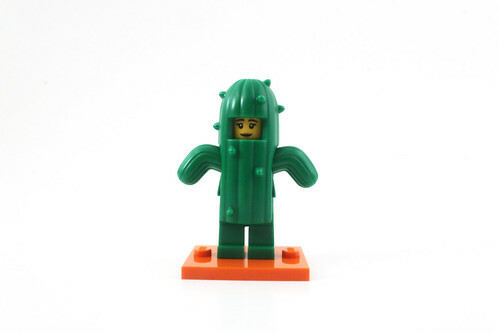 The Cactus Girl is another mascot type minifigure for Series 18 and as her name states, she’s dressed up as a cactus. The torso is green with some lines going down it on both sides. 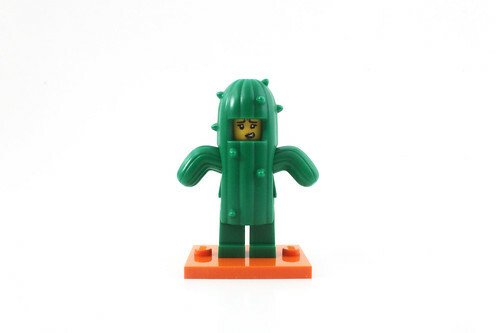 The arms on the cactus are replaced by some branches that are able to move. The legs are plain green. She has a double-sided head with a smile on one side and nervous look on the other. The Cat Costume Girl is fairly bland with the torso has printing of the cat fur with an identification tag around the neck. The arms have some printing of the white fur as does the lower part of the legs. 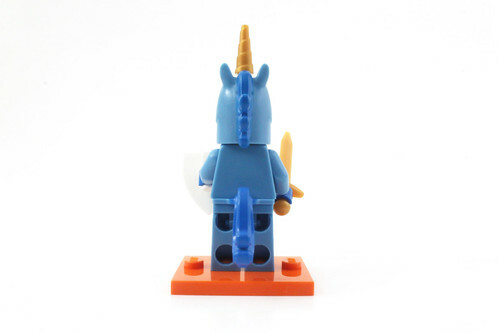 Like with other anthropomorphic minifigures, there is a tail piece that go between the torso and legs. The cat head piece looks more like a mask to me than an actual cat head however her facial printing also shows her with cat makeup. Her accessory is a teal fish piece. 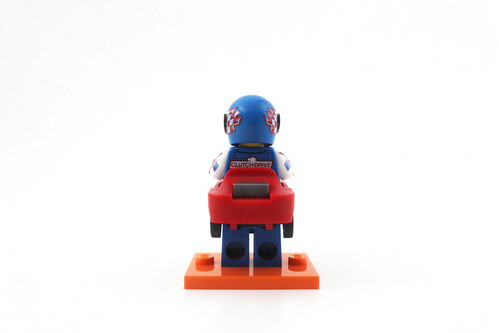 The Race Car Guy is in a blue and white racing suit with some nice printing on the arms and on the side of the legs as well as on the back. There’s a rather large race car that goes around the waist and it doesn’t look too bad. The head shows him with a confident smile with a soul patch. The helmet is blue with some printed patterns on it. 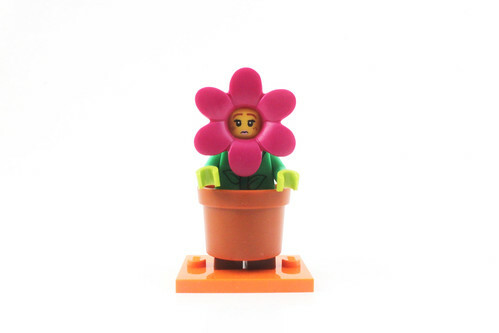 Another interesting minifigure for Series 18 is the Flowerpot Girl. The torso is green with some printing of vines going down the middle. The legs are plain brown but there’s a large brown flowerpot that goes on them so you can barely see the legs. Going over the head is a large dark pink flower petal piece. Her facial expressions include a happy one and a sort of a sad one. 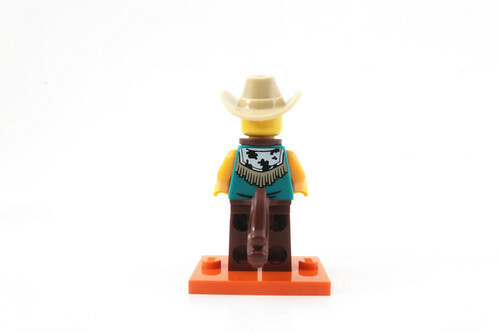 The Cowboy Costume Guy is actually a pretty intricate mininfigure. He has a no sleeve teal colored torso with a nice vest printing on both sides. There’s a harness that goes around his neck for the front of the horse while another goes around the waist for the tail. 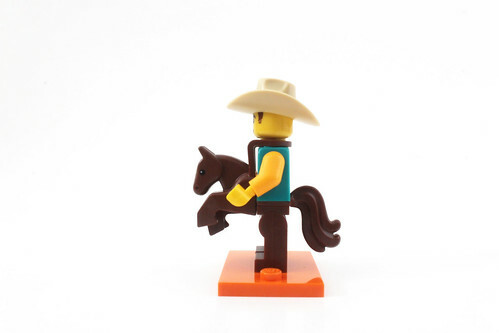 The legs are plain brown to match up with the color of the horse. The head shows him with a smirky smile and he wears a cowboy hat to complete the look. The Birthday Party Boy has a blue polka dot shirt with a striped tie. He has some short legs showing him with some black shorts and white shoes. The head shows him with with a smiling expression with some green eyeglass frames. 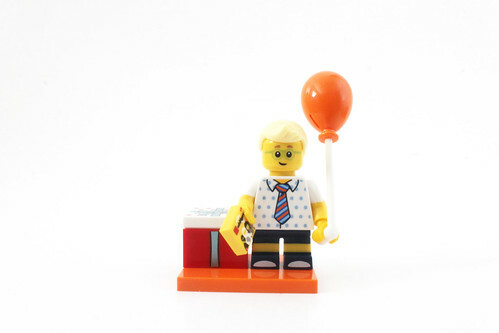 He has a plethora of accessories including two 1×1 printed tiles of LEGO Collectible Minifigures packets, a decorated present, and an orange balloon. The Unicorn Guy is a complement to the Unicorn Girl from Series 13 with some updates. He is a light blue color with some gold star printing on the front of the torso. The tail piece is the same as before but now in a darker blue color. The helmet mold is the same as before but in the new lighter blue color and now has a pearl-gold horn that goes over his winking expression head. 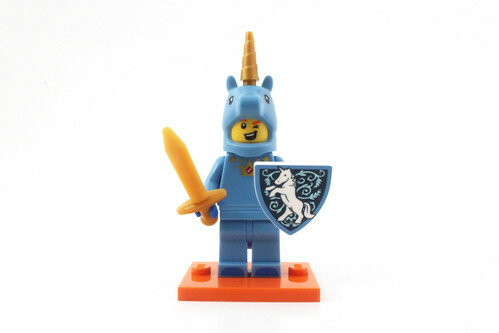 His accessories include a pearl-gold sword along with a printed unicorn shield. 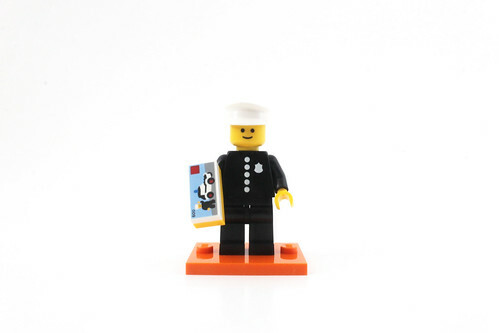 Probably the most generic but also most highly sought after minifigure in Series 18 is the Classic Police Officer. 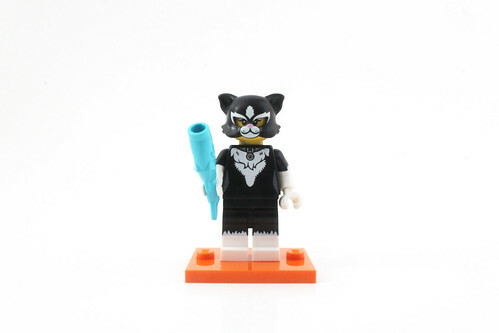 He is basically a re-release of the minifigure from the LEGO Classic Town Police Car (600-2). The torso plain black with printing of some white buttons and the badge. 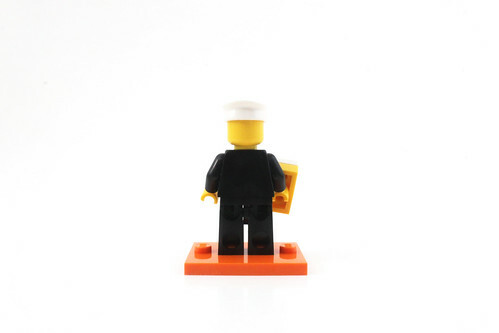 The head is the classic minifigure smiley face and he wears a white cap. The accessory is a printed 1×3 tile of the aforementioned Police Car set which is a nice tribute to the vintage set. The reason why I call the Classic Police Officer a chase figure at the beginning of this review is because he does only come one per box. This means that it’ll be extremely difficult to obtain this minifigure due to its scarcity. I wouldn’t be surprised if a majority of the fans will skip this minifigure entirely and just focus on the main group of the Series 18 minifigures but there will still be many who will try to get this one to complete the full set one way or the other, even if that means going to the secondary market which will probably fetch pretty high price. We’ll just have to see how expensive it will be once this series is available. 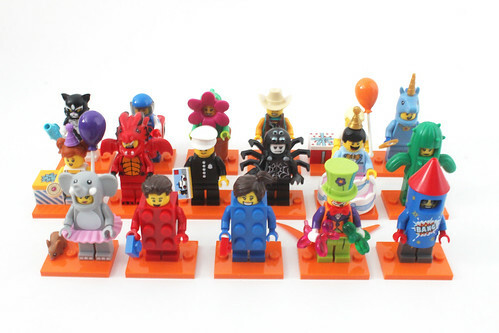 Overall, I really like the Series 18 LEGO Collectible Minifigures (71021). 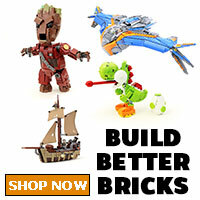 Even when the rumors started swirling last year for them, I was excited to see what LEGO could come up with. This series may not appeal to some fans because they mostly consist of costume characters but from what I’m reading online about them, a majority of people actually like them. 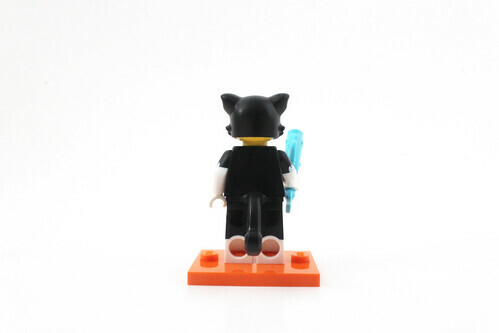 One thing to note is that all the minifigures come with a new orange baseplate instead of the standard black ones. The only thing that I feel that people will be angry/disappointed about is the one Classic Policeman that comes in a full case of 60 because I assume that everyone, including scalpers, will be searching for it. Like I said before, you don’t have to have it unless you’re a completionist. He will be hard to get but won’t be as hard as Mr. Gold from Series 10. Below is the distribution for my box so you can get a sense of what you can expect to find in a full, unopened box. As you can see, you get three complete sets of 16 if you decide not to go for the Classic Policeman or you can get one complete set of 17 if you do want to get him. 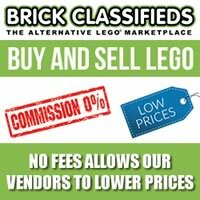 The Brick Suit characters has the most per box at five while there are a few that only have three per case. It will be hard to gauge what people will be looking for as people has different interests/tastes. 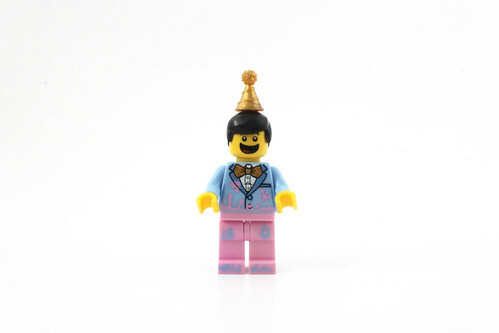 For me, my favorites of Series 18 are the Party Clown, Dragon Suit Guy, Birthday Cake Guy, Race Car Guy, and Cowboy Costume Guy. 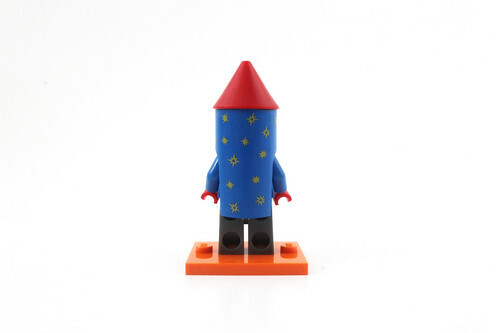 The LEGO Brick Suit costumes are interesting and I do like how they are able to connect to other bricks. Which one(s) are you guys looking forward to getting? Let us know in the comments below.